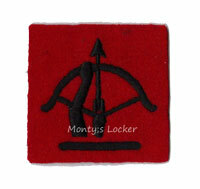 Probably the most commonly seen anti-aircraft badge of WW2. It was adopted by all units from late 1942. (please note there are a huge number of variations in existence of this badge).